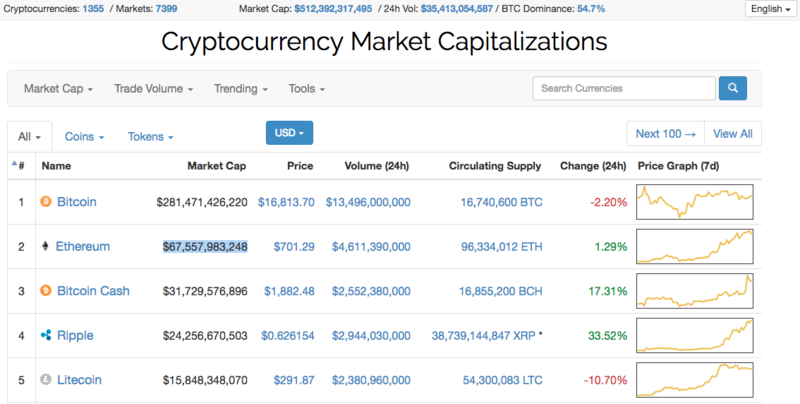 The entire cryptocurrency market capitalization industry, as of December 2017, comprehends 1356 cryptocurrencies, distributed through 7399 Markets and has reached over a Market Cap of: USD 512,399,666,569 with an average 24h Vol: $35,143,431,900. This with a crypto currency Dominance of Bitcoin BTC: 54.9% (source https://coinmarketcap.com/). The cryptocurrency market capitalization industry has reached $512 billion for the first time in history. This is a huge increase and somehow astonishing bearing in mind that it was $40 billion market cap at the beginning of 2017. Bitcoin has been driving this explosion and December has shown a dramatic month for the cryptocurrency space. While digital currencies that had been gaining in value suddenly lost much or their gains in about 36 hours in the first week of November, Bitcoin has been in a super stardom growth. BTC saw its price climb to atmospheric new highs of more than $7,500 and $8,000 per coin for the first time in November, and then over $16,800 by mid December, due to various news how bitcoin futures would be available before the end of 2017. This while Bitcoin Cash has been as well growing crazy. Bitcoin and crypto are evidently associated with volatility. Despite the swift gains in the overall market cap for the cryptocurrency industry, the market displays accentuated waves, and has yet to shed any of its characteristic volatility. On the contrary, there’s been increasing levels of volatility during the weeks leading up to the record-setting market cap level as compared with the rest of 2017. The trend might continue and bitcoin traders are conscious of this. Currently, however, the situation seems to primarily affect altcoins, which have seen a major downturn. In spite of their lost value, those coins are nonetheless a portion of the market cap that has climbed very high. Bitcoin, which can be used to send and receive payments online, is similar to payment networks like PayPal or Mastercard, the difference being that it runs on a decentralized network—blockchain that is beyond the control of central banks and regulators. It was born out of an anti-establishment vision of a government-free society, a key attraction for those fed up with centralised institutions, and seeking unhindered access to their capital, in case a massive shock shuts down the banking system. Across the digital currency space, it may come as no surprise to investors, that bitcoin remains the fixture of the market cap. All bitcoins in circulation are worth more than $250 billion at this point. Bitcoin has been the leading digital currency in terms of market capitalization since the beginning of the trend, but that figure is still impressive, considering the total market cap for the cryptocurrency space was less than one-third of that just a few months ago. Accompanying the rise in bitcoin’s price is an increase in the Bitcoin Dominance Index. This index sits at more than 60%, suggesting that bitcoin remains the most important digital currency for the time being. Of course, considering the extreme volatility in the market, it is a safe bet that bitcoin’s value will fall at some point, and that altcoins will see their values increase once again. For now, bitcoin prices are still driven primarily by speculatio even if a price correction for the currency. is almost sure to set off. As of this writing, Ethereum remains the second-largest cryptocurrency by market cap, with a total market valuation of more than $67,894,669,367 USD . Bitcoin Cash is in third place, although it, too, remains far behind its bigger brother, the original bitcoin. The $500 billion benchmark is significant for the cryptocurrency industry, but it is relatively paltry compared with traditional companies and investment instruments. Nonetheless, it is an important milestone in a rapidly-growing space. $1 Trillion for the Cryptocurrency market cap in the end of the year or in 2020? Big hedge funds and investment firms are moving to crypto currencies, particularly to Bitcoin, and recently Coinbase Custody Targeted $10 Billion in Institutional Funds for Bitcoin Investment. According to a recent Juniper Research there is a prediction that there will be $1 trillion in crypto transaction value by the end of 2018. The total number of global cryptocurrency transactions is still growing. To put the explosive growth in cryptocurrency in perspective, $1 trillion of transactions is roughly 15 times the total number of transactions registered in 2016. We are talking about early days but the numbers speak for itself. Bitcoin, Ethereum and over 1355 digital tokens are now accounting for more than $35 billion in daily transaction volume. Bitcoin is the king and remains the gold standard in cryptocurrency, with, as we said previously, a current market cap of more than $277 billion even after a split with Bitcoin Cash in August and soon another one with Bitcoin Gold. Speculation has come to high levels and as researcher Dr. Windsor Holden says the bitcoin community may be the currency’s biggest hindrance, at this point. Bitcoin’s rival Ethereum accounted for a surprising two-thirds of total cryptocurrency transaction value in the first half of 2017. Huge price gains now have Ethereum’s market cap above $67 billion. Juniper reports that Litecoin, the fifth-largest cryptocurrency by market cap, has also experienced a surge in popularity and should account for more than $14 billion in total transactions in 2017. Some of bitcoin’s most enthusiastic proponents are people motivated by the belief that society does not need central banks or middle men operations and that the public infrastructure doesn’t serve us anymore, and that it might or will collapse in times of social and political distress. 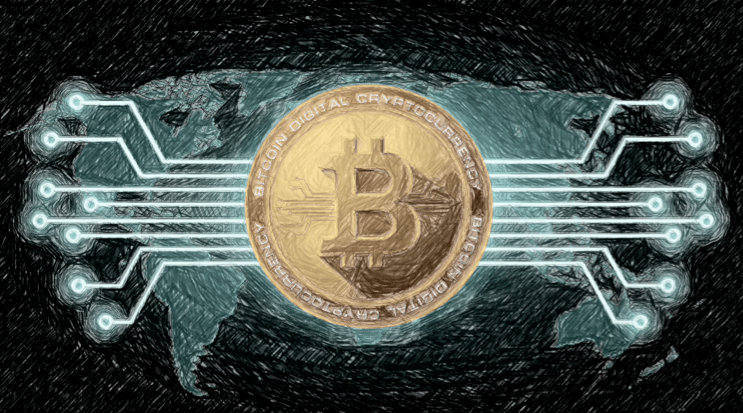 Bitcoin isn’t yet widely accepted as a method of payment and its sharp transaction costs make it inconvenient to use by the vendors that do take it. Discussions on the pros and cons of investing in crypto have popped up on survivalist forums like mysurvivalforum.com and survivalistboards.com this year as bitcoin rallied above $7,000. “Buy bitcoin” is now a more popular search phrase than “buy gold” on Google. 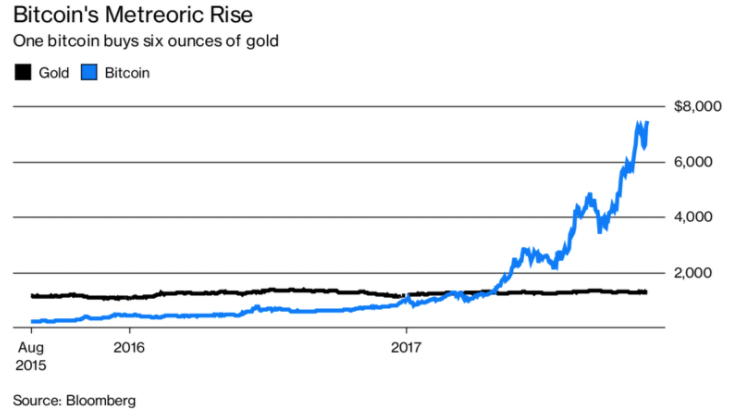 The buzz is starting to impinge on gold’s role as a store of value particularly because, just like the precious metal, there’s a finite supply of bitcoin, which proponents say, gives it anti-inflationary qualities. Sales of gold coins from the U.S. Mint slid to a decade low in the first three quarters months of 2017. The buzz is starting to affect gold’s status as a store of value especially since, like the precious metal, there’s a finite supply of bitcoin, which proponents say gives it anti-inflationary qualities. Sales of gold coins from the U.S. Mint slid to a decade low in the first three quarters months of 2017. Are Capital Markets taking Cryptocurrencies Seriously? Despite the huge growth numbers cryptocurrencies are achieving, there are still plenty of skeptics out there. Earlier this week, Citron Research short seller Andrew Left reiterated his short thesis on the Bitcoin Investment Trust GBTC 0.28% and said the trust is overvalued by more than 50 percent. This increase in value is mainly driven by Bitcoin and Ethereum. 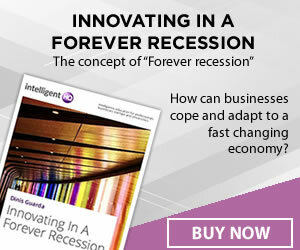 Especially now that both ecosystems are inching closer to creating a scalable ecosystem in the future. Interesting things are bound to happen in the future. If more transactions can be processed on those two networks, we may reach the projected US$1 trillion cap a lot sooner than anticipated. The new research projects this value will be attained at some point between now and 2020. One also has to keep in mind the typical daily trading volume of all major cryptocurrencies combined is well in excess of US$2 billion these days. We have seen US$6 billion or even US$9 billion, depending on the day. Bitcoin itself handles around US$ 13 billion in 24-hour trading volume on a regular basis now, which goes to show the global demand for cryptocurrency will not slow down anytime soon. Ethereum and Litecoin have also seen major increases in trading volume throughout 2017. 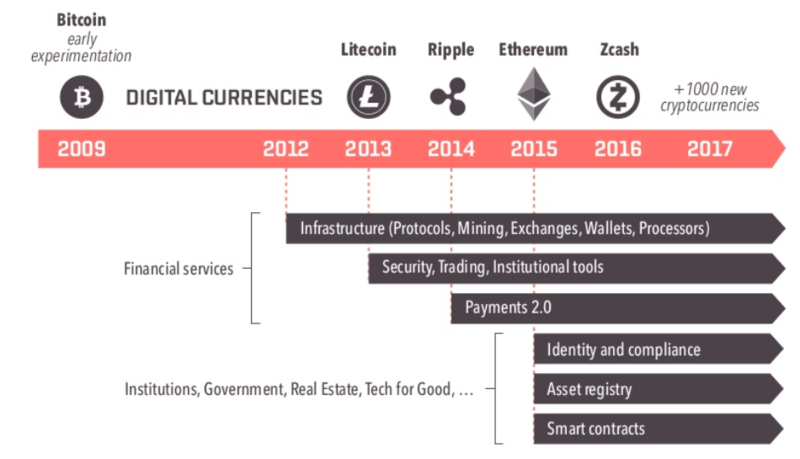 As blockchain technology is evolving through scaling solutions and new use cases crypto currencies will grow . That does not mean every single industry or business model can benefit from blockchain technology, although there is still a lot of research to be done over the next few years. It will be important to see positive research related to use cases for cryptocurrency, as a lot of people still associate these currencies with illegal activity first and foremost.